Summary: The Museum would like to enhance our existing mobile educational school resources and school/community partnerships by developing/acquiring a Traveling Turtle Trunk. MODS will replicate Inwater Research Group has the Traveling Turtles all-inclusive trunk. The trunk will include skull replicas of the 5 sea turtles we see in Florida’s waters. The trunk will also include model turtles, egg replicas of sea turtles, calipers, and a lesson binder. The MODS program will be specific to the Broward County School district, which is the second largest in the State of Florida. Educational curriculum and other products will be incorporated into MODS’ Traveling Turtle Trunk. MODS’ staff will provide the educational lessons and or partner with teachers to facilitate discussions when offsite from the Museum. Results: MODS acquired the items for the traveling trunk, and compiled educational materials for the development of a curriculum resource binder. The educational binder was created utilizing online resources from previously funded Conservancy Fund grants and wildlife conservation websites. A Museum on Wheels Totally Sea Turtles outreach program developed for schools to book, is incorporated into the Museum's Educator Guide. The Sea turtle program was also included in the Museum’s Explorations magazine. 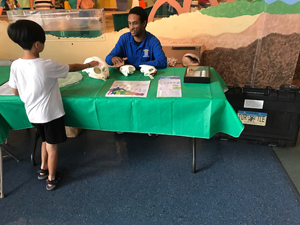 MODS’ staff partnered with teachers to facilitate Sea Turtle preservation/education discussions by taking the mobile Sea Turtle Trunk to teachers at the Broward County Public Schools Science Teachers Night. Approximately 100 teachers were present. The Broward County School district is the second largest in the State of Florida. In addition, the Museum's yearly Sea Turtle Nesting Walk program launched in early June and continued into the middle of July offering 12 public watches that educated 360 tourists and locals alike on the plight of Florida’s sea turtle population. These 12 walks allowed visitors to observe in an ecologically sensitive manner, the nesting process of female Loggerhead Sea Turtles. Turtle walks enhance the care and respect that the public have for endangered sea turtle populations. A presentation, by one of MODS' lead educators at the Museum, prior to the beach experience allowed the participant to learn about sea turtle natural history, impacts (both natural and human related) and the importance of conservation efforts related to the protection and survival of Florida's Marine turtles. Due to partial funding awarded, the expansion of the turtle conservation program was limited to onsite trunk presentations and contents utilization on the floor of the Museum for visitors, trunk content usage in presentations prior to turtle walks and one outreach event to Science Teachers. Sea Turtle Trunk and educational materials utilized during MODS' Ocean Explorers Camp. There were also minor challenges in finding supplies such as the Kemp Ridley sea turtle skull. Savings in purchases will be utilized for other sea turtle educational related supplies to be purchased to include in program.